It wasn’t just the cryptocurrency miners who robbed all of our AMD Radeon graphics cards. No-one’s talking about the fact that Microsoft, and their Xbox One X console in particular, stole away a potential GPU which could have become a PC gaming hero, the card that could have become the RX 490 and RX 590. In all the excitement that surrounded the AMD Vega launch last year, it’s easy to forget team Radeon did actually release another new GPU generation in 2017. OK, the ‘excitement’ actually only predated the Vega release, after launch it was all just angst, recriminations, and still no stock even if people did want the RX Vega 64 or AMD Vega 56. Anyways, the AMD RX 500-series cards were a bit of a disappointment too given that, despite their Polaris Enhanced architecture, they were essentially just rebadged versions of the RX 480 and RX 470s that went before them. However frustrating the rehashed silicon might have been that still meant they were pretty decent GPUs in their own right. In fact, for a brief moment in time, the RX 580 got to the point where it was priced so aggressively against the competing Nvidia GTX 1060 that it became our pick as the best graphics card to buy. While we had broad Radeon RX 400- and 500-series ranges come out of the AMD graphics card skunkworks, there was a definite sin by omission across both generations. When we were first introduced to the Polaris GPUs at an AMD event in Munich they presented us with a slide to explain the naming scheme behind the new RX series cards. 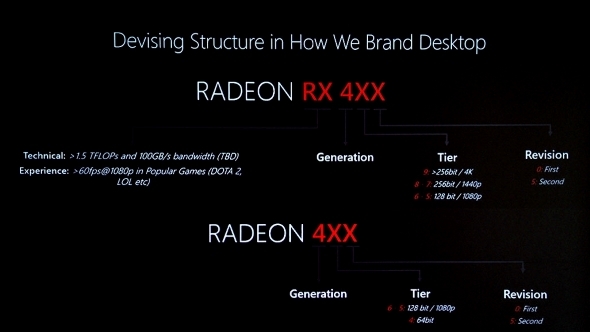 A slide which offered a tantalising glimpse into the Radeon future. It was pretty standard stuff, following a similar nomenclature to their previous generations of graphics card. The three number designation would split up so that the first number would indicate the generation, the second would indicate what tier the card lived in, and the third would be able to show whether this was the first or second revision of a particular SKU. It’s that second number which is the most interesting as we’ve only ever had two of the three indicated tiers of Radeon graphics they were initially proposing. We never saw either an AMD Radeon RX 490 or 590, sporting the top-spec GPU that would offer more cores, a wider memory bus, and support for 4K resolutions. You could argue that’s because they still haven’t been able to create a Polaris GPU which is actually capable of driving games at 4K, but that’s not strictlytrue. 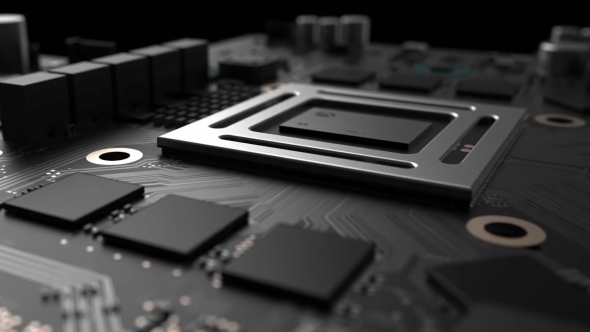 There is an AMD Polaris graphics chip at the heart of Microsoft’s Xbox One X, and that’s being sold as a genuine 4K gaming console. 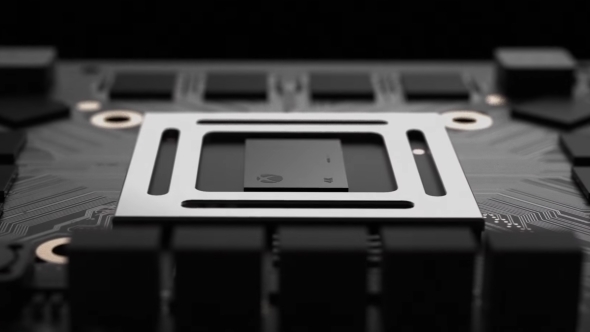 The Scorpio GPU inside the Xbox One X isn’t completely identical to a desktop Polaris GPU, however. 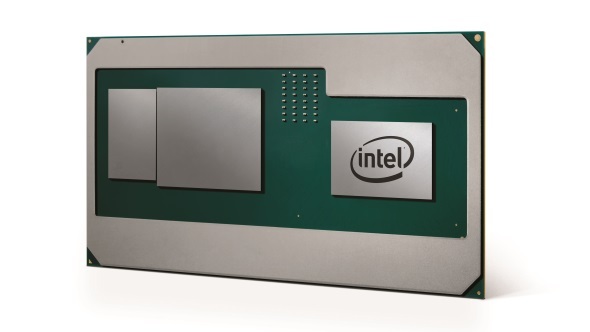 It is still essentially using the same AMD Graphics Core Next (GCN) 4.0 technology despite being built on TSMC’s 16nm production process, as opposed to the 14nm one used inside the 400- and 500-series Radeon cards. What it does have is more compute units than the top-end AMD RX 580 Polaris card. The RX 580 has 36 CUs, delivering 2,304 GCN cores, while the Scorpio has a full 40 CUs and therefore 2,560 GCN cores. That’s a good chunk more graphics processing silicon that we know AMD could have built into a functional graphics card themselves. So we know they could have built a Polaris GPU with 40 GCN cores using the 16nm process, so you’d have to believe AMD would have been able to at least match that using their 14nm lithography. And probably push it a little further to incorporate a couple more CUs for shizzles and gizzles. What sort of performance could you have gotten out of the RX 590 with 2,560 cores inside it? Despite only having another 11% more GPU componentry, the silicon delta between the RX 570 and RX 580 is the same and that translates into between 20-25% difference in baseline gaming performance. And if the RX 590 had retained the same 384-bit memory bus the Scorpio is rocking then that’s a percentage performance increase they would have easily matched. Now Microsoft didn’t just grab all the potential 40 CU GPUs that AMD could make before they could slot them into a new card themselves. Microsoft licensed the design and had the Xbox One X chip manufactured as an APU with the 2,560 core Polaris GPU only making up one half of the processor / graphics equation. 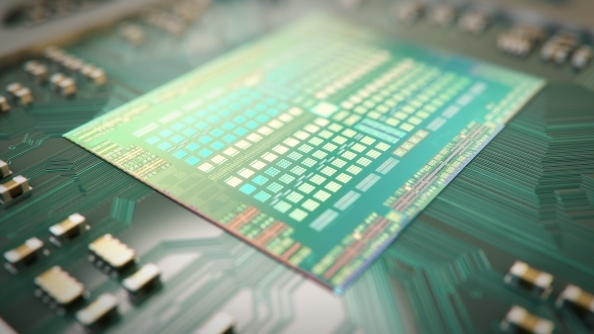 But there must be a reason why AMD chose not to manufacture their own 40 CU component. It’s possible that was a part of the licensing deal with Microsoft, that they wouldn’t create an essentially identical GPU themselves, particularly as AMD’s discrete graphics card variant would likely have ended up running with a higher frequency, and potentially faster performance, than Microsoft’s flagship console. That would never do. And that possibility does make me a little nervous for the possibility of seeing an AMD APU with the level of Vega M GPU power Intel have licensed for their Kaby Lake G processors. Obviously, that’s a rather moot point these days. 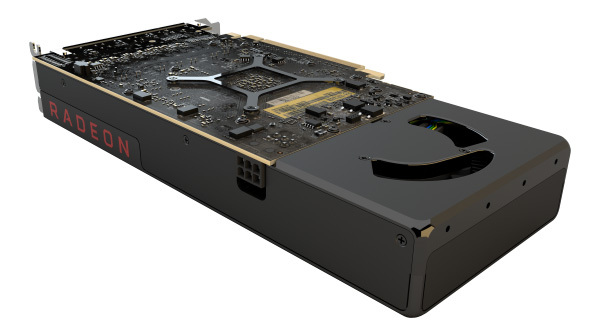 Whatever Polaris GPUs AMD had released last year they would still be swallowed whole by the mining community, making its absence largely irrelevant. I just thought it was interesting (read: sad) that there was an entire potential PC gaming GPU that we never got to play with and yet the console cool kids are enjoying right now.